Back For Seconds: Zebra Tres Leches Cake and My First Link Party! It's party time, friends!! Welcome to my very first link party, I am thrilled to have you here! And what's a party without cake, am I right? 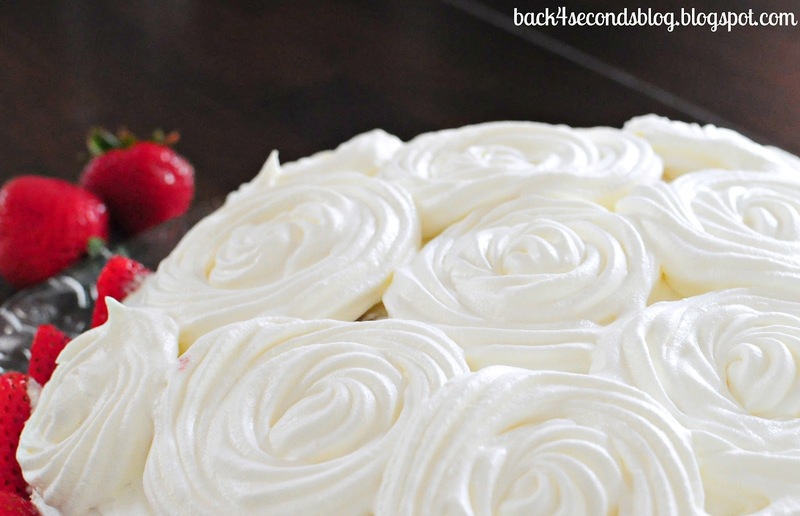 Have you ever had a tres leches cake? Ohmygoodness they are delicious! To say it is moist is an understatement. I mean, it's a three milks cake after all. One of the coolest things about this cake is you can totally change the flavor depending on the types of milk you use. Traditionally, I believe, cream, evaporated milk, and whole milk are used. While that is tasty, I like to switch things up a bit. I used vanilla cream, evaporated milk, and condensed milk. You know it's good if there's condensed milk inside! Next time I think I will use coconut milk too....Mmmmm. And take a look at the wild surprise inside! 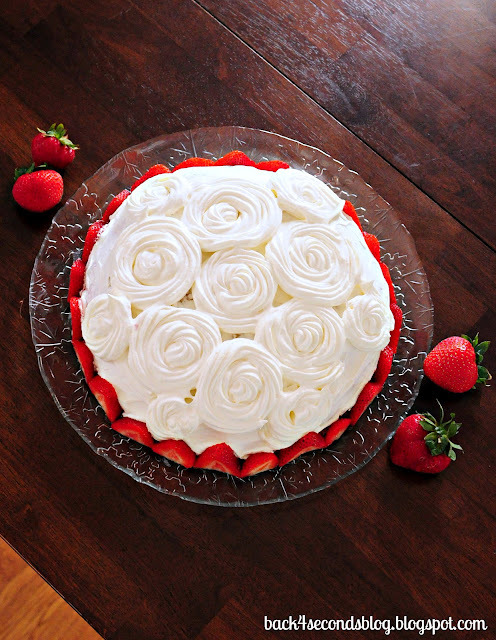 Impress your friends - make this cake for your next party! In a large bowl cream butter and sugar. Add in vanilla and eggs one at a time, beating after each egg addition. Gradually add in the flour and baking powder until incorporated. 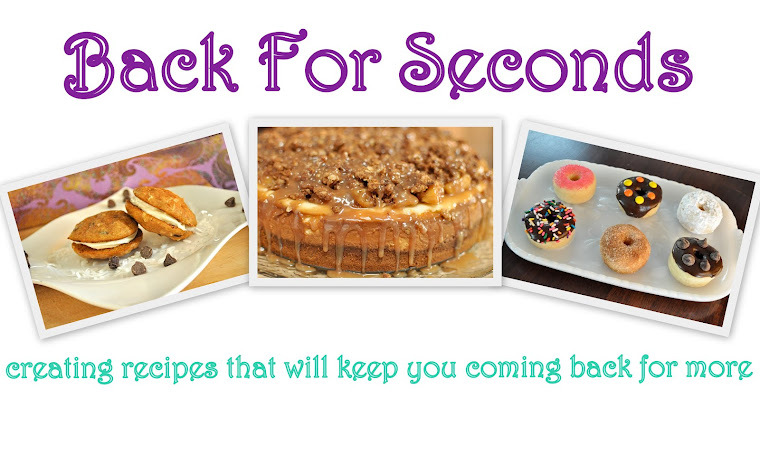 If making the zebra design, separate batter in two and add food color of your choice. Grease a 9"springform pan. Drop 2 Tbs of one color in the center of the pan - do NOT spread it out. On top of that drop 2 Tbs of the other colored batter, again, don't spread it out. Continue this pattern until you have used all the batter. Bake for 28-30 minutes or until toothpick inserted comes out clean. Let cool most of the way before adding the milks. 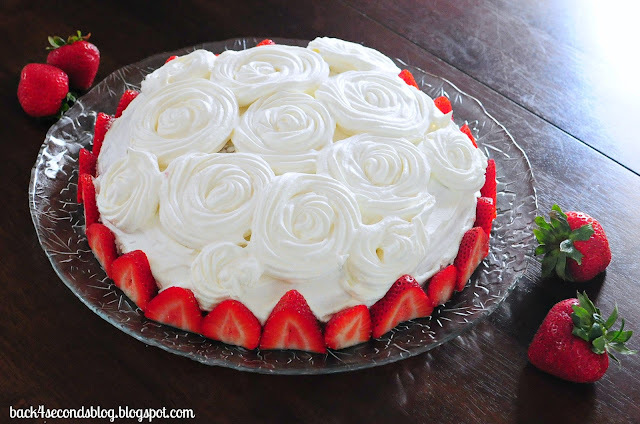 Just before serving, top with whipped cream and strawberries if desired. The cake is so moist you really don't need to add anything else. I like the presentation though! Refrigerate any leftovers. Since this is my first party, I would be over the moon thrilled if you would help me spread the word! A party isn't a party without all of you! Invite your friends - tweet, facebook, blog, instagram your besties and tell them the Back For Seconds Social is where it's at! You guys rock! Yay! Congrats on your party, Stephanie! And that cake is beyond gorgeous. This Zebra tres leches cake is amazing. I switched the names between no. 8 and 10 - I hope you can fix it. Congratulations on your first party...thanks so much for hosting! That cake is gorgeous!!! Those rosettes are perfect! THanks for hosting! Happy to be at the first link party at Back 3 Seconds! Congrats on your first link up!!! I'm so excited for you and your cake is awesome. Awesome Cake! Thank you for hosting and congrats on your 1st party. Have a great day! Congratulations on hosting your first link party!! That cake is gorgeous and looks so delicious too!! Thanks for hosting! That cake is lovely! Wishing your link party much success! I'll be back each week :) I'll add your party to my master list too. Have a great week! Congratulations for the wonderful success your new linky party is! Thanks for being such a gracious hostess! Now off to visit other party animals! So happy to be here at one of the sweetest parties in Blogland! 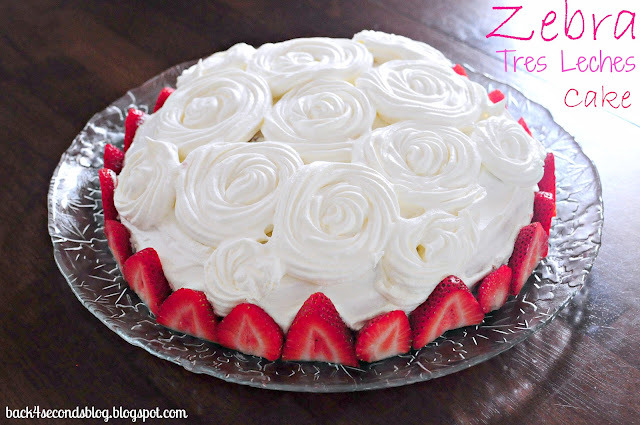 Your tres leches zebra cake look delicious! Your cake looks amazing! I'll add your party to my list. Thanks for hosting! what a BEAUTIFUL cake!!!!! Thanks for hosting Stephanie and CONGRATS on your frist link party! I've already bookmarked quite a few of these! CONGRATULATIONS!!! Your recipe has been chosen to be on Today's Feature Post from Cast Party Wednesday! Thank You for sharing your recipe with us! I came over here to award you with the Sunshine Award, am I am rewarded with a new Linky Party! Winning!! I'll add your party you my linky page :) and come back next week to share more treats. Also, I want to let you know that I am awarding you the Sunshine Award. I love your site! You have beautiful pictures of yummy food. I'm seriously drooling right now:) making this tomorrow! I'm your newest follower. Stop by sometime. Wow, that sure is a surprise cake. Congrats on your first party!! it's stunning. i still haven't had an opportunity to make a zebra cake, or decorate a cake with buttercream roses. I should do both at the same time, like you! Thanks for the invite! :) I brought my favorite new spaghetti sauce, straight from the garden to your stock pot. What a GORGEOUS cake and congrats on your party. I'm getting caught up so hope to have something to link up this week! This is beautiful and scrumptious looking! I'm sorry I missed your first link party, congrats! I'll definitely be back for the next one. What a fun cake! I love tres leches! 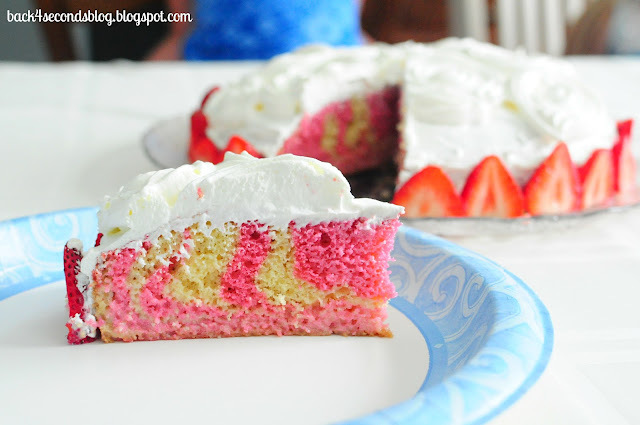 Gorgeous cake and it sounds super delicious! Looks like you had a great turnout for your first party, too! What a beautiful cake. Thanks for sharing on Tout It Tuesday. Hope to see you tomorrow.